Berlin’s achingly cool area of Friedrichshain is never far from my mind. A regular haunt during my time in the city, my friends and I took in numerous bars, clubs and sightseeing hidden in crazy little corners. This area of the city opens up as a Mecca for downmarket restaurants – think greasy fruitti di mare lasagne made with rubbery frozen mixed fish – and uninspiring cocktail bars with bizarre concoctions dreamt up with just a whole can of peaches and tequila of dubious origin. But there is also the down low dirty club vibe, with the likes of RAW enticing locals to mingle with party tourists, brick walls dripping with sweat, dubstep pounding from the speakers and holes in the wall that hint at Berlin’s reputation amongst the debauched crowd. Which is surprising, as just around the corner from RAW’s frayed edges and rubber stamp entrance tickets, a snippet of Parisian charm sits nestled between an independent book shop and a stationary store. Entrance marked by two curling metal chairs slicked in white paint and tiny tables adorned with simple flower arrangements, Olivia’s Schokoladen & Tartes Cafe opens up carefully like a tiny flower, beautiful and sweet – but when I first glanced upon this place, I genuinely wasn’t sure if it was a matter of style over substance. The cafe itself isn’t much of a cafe; in fact barely two bodies could stand inside without constantly standing elbow to elbow. But perhaps that is part of the charm. As soon as I stepped inside, a cheerful German woman arrived at my side, speaking clear German with a smile. Although I probably could have responded happily, I remember choking on the words and instead, the usual phrase of Ich spreche keine Deutsch left my lips. No matter, she switched to my native tongue and asked what I would like. My impressions of Olivia’s was spiked heartily as I gazed into this glass capsule bursting with creamy cakes, tartes and chocolate creations that I would have happily poured over for hours. I plumped for my growing favourite, a chai latte and a sliver of the Pfirsch, Pistazien und Ricotta Torte which the woman carried to a table out front. And there I sat, watching the world go by with what remains to this day the best confection I have ever sampled. It sounds melodramatic, but I have yet to come across anything quite so beautiful to satisfy my Kaffee und Kuchen cravings. A take on the German-styled Quark cheesecake, this baked affair was light and fluffy, like marshmallow cream. Slicked across the top were comforting slices of tinned peach, lurid and neon in colour but with just the right amount of sweetness. 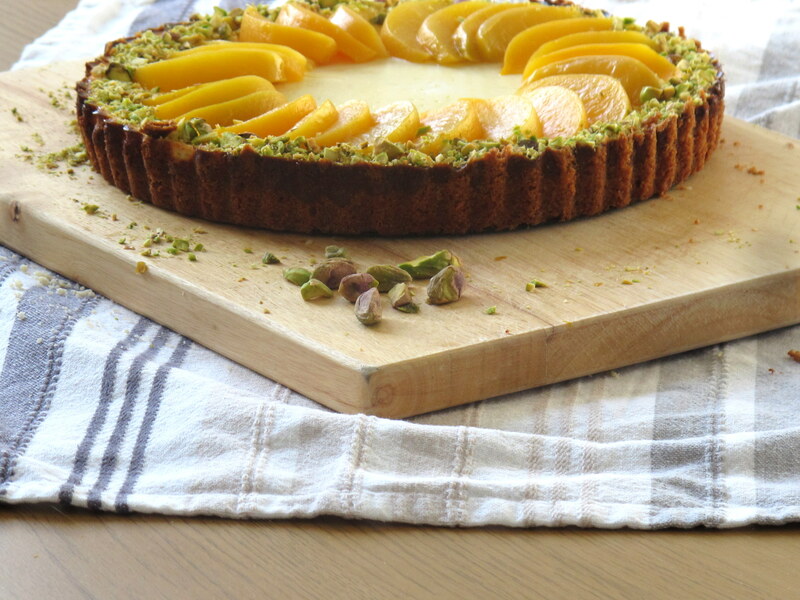 A slick of clear jelly topped the torte off with ease and a delicate sprinkling of pistachios set the slice off. Pure cake perfection. I have come close many times to just attempting to recreate this torte, but the memory of Olivia’s version seemed too good to tarnish with my bumbling attempts. Still, a German themed entry into bake club a couple of months ago prompted me to scour the internet to research German desserts – with the cheesecake continuously creeping onto my screen as I searched. I threw caution to the wind, gathered up my ingredients and set to work. I wouldn’t wholeheartedly call this torte a carbon copy – the base is the same, crumbly and soft with that added depth of almond. The cheesecake-style filling is milky sweet and not dissimilar to nursery rice pudding. I am a sucker for tinned peaches – the lurid the better – and decided to keep this sliver of nostalgia along with the beautiful pistachio crust. I may revisit with the clear jelly at a later date, but this torte is so flavoursome, I really don’t think it needs it. 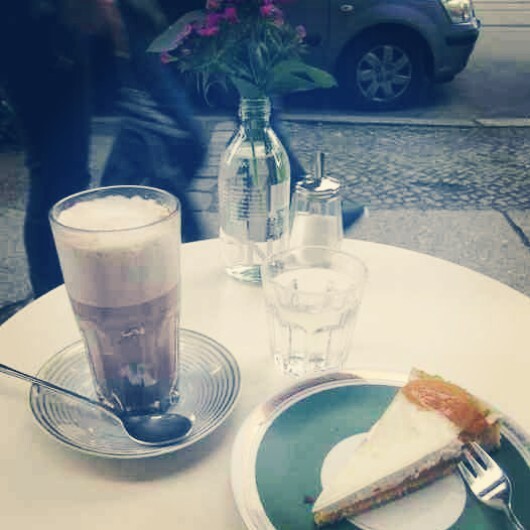 For now, this is the closest I’ll get to my Kaffee and Kuchen days in Berlin – but I would be more than happy to return one day to sample the Schokoladen. Preheat an oven to 160oc/140oc fan/Gas Mark 3. Grease a 23cm fluted flan tin or loose bottom cake pan with butter and set aside. 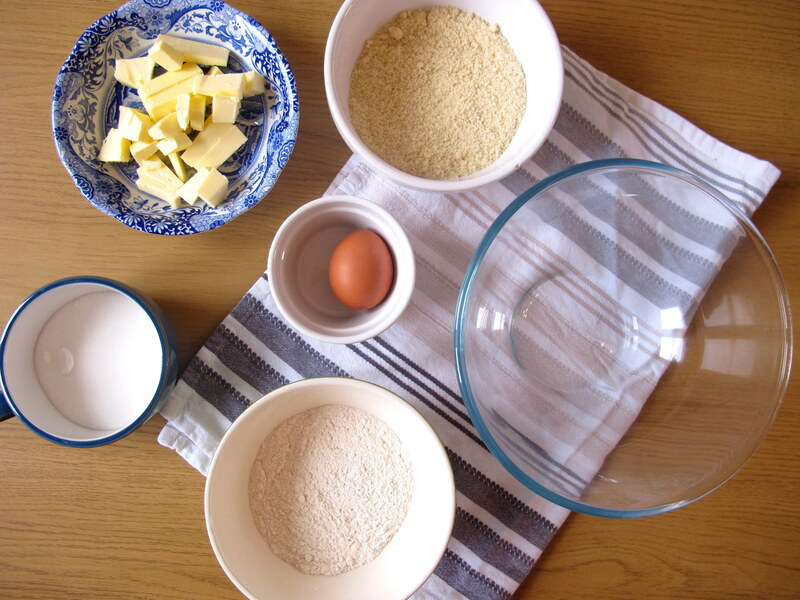 In a large bowl whisk together the almonds, caster sugar and flour. Rub in the butter with your fingertips until the mix resembles breadcrumbs. 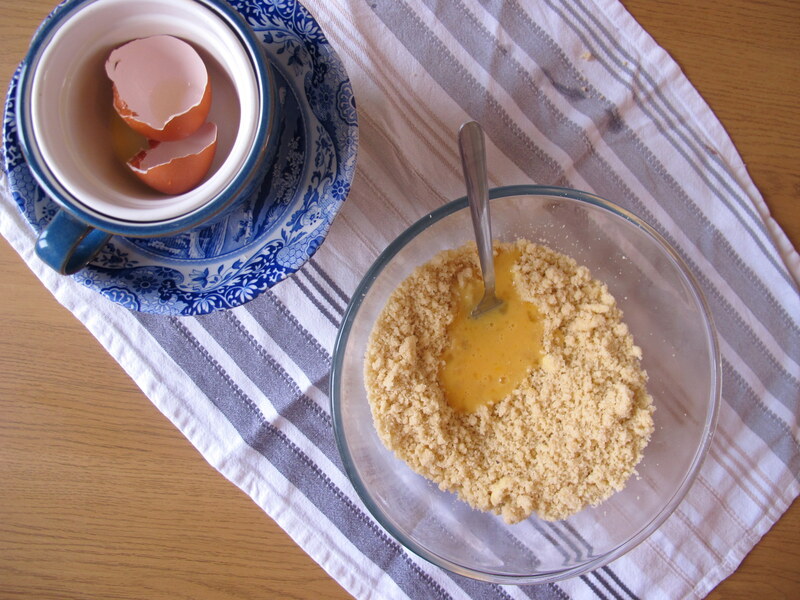 Add the egg and mix to form a smooth paste. Smooth into the bottom of your pan and bake for 25 minutes until just set. Tip: My tart tin isn’t particularly deep, and as the base rises due to the self-raising flour, it can encroach a little towards the top. To counteract this, I took out 2 tbsp of the paste and baked in an individual flan tin for a tester torte. If you have a springform tin, this won’t be an issue. If it is looking a little tall, simply squash down with the back of a spoon. 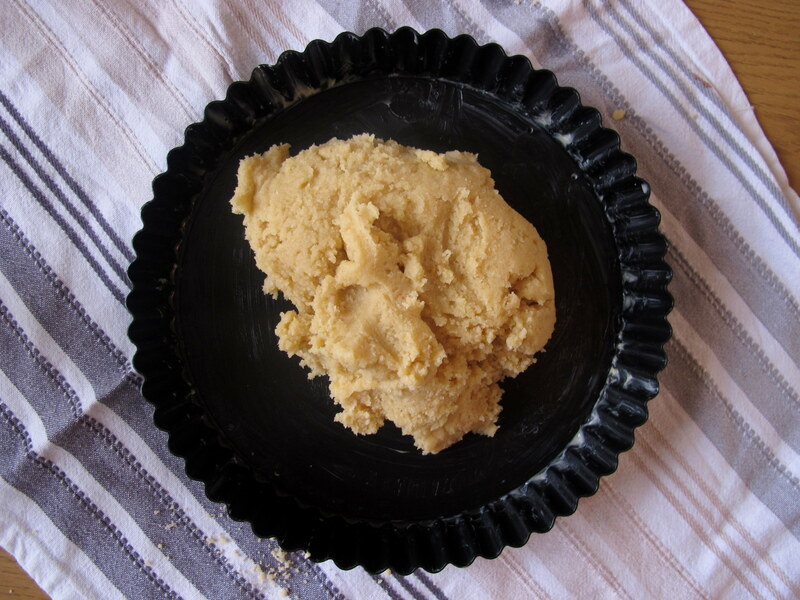 To make the filling, beat the ricotta in the bowl of a stand mixer to loosen a little, and then add the eggs, sour cream, caster sugar and vanilla until smooth. Pour on top of your torte base and return to the oven for a further 50 minutes until the mixture is just starting to set and the edges are golden brown. Remove from the oven and leave to cool in the tin for 10 minutes before removing and cooling completely. 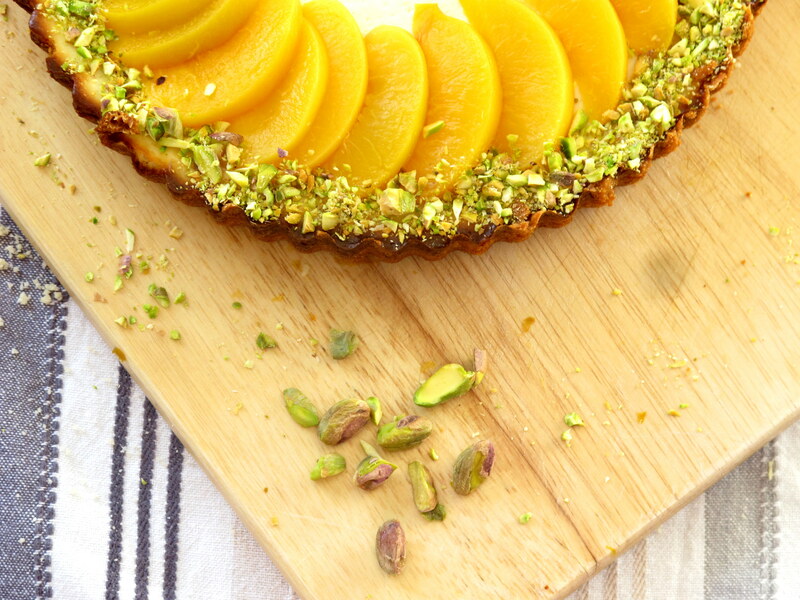 To finish, arrange the peach slices in a circle 1cm from the edge, filling the gap with the smashed pistachios. Chill then slice up when ready to serve. I do have a serious soft spot for peaches – as soon as summer comes around I make dozens of recipes with them. I may be addicted. Thanks for stopping by!